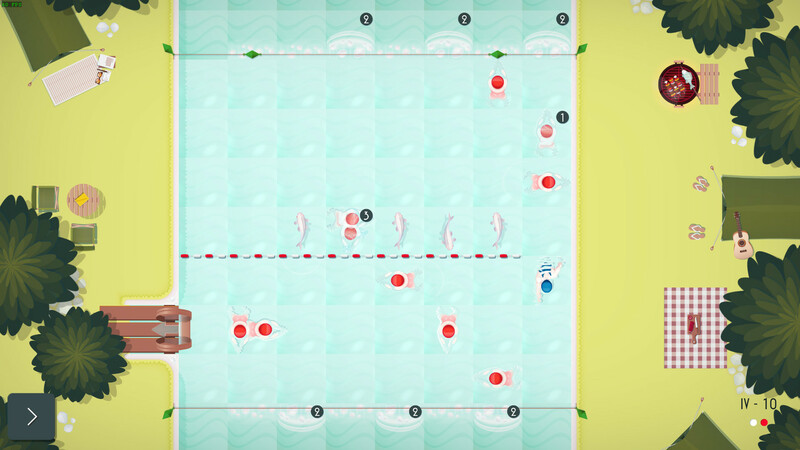 A game about swimming might not be the most obvious premise for the puzzle genre. 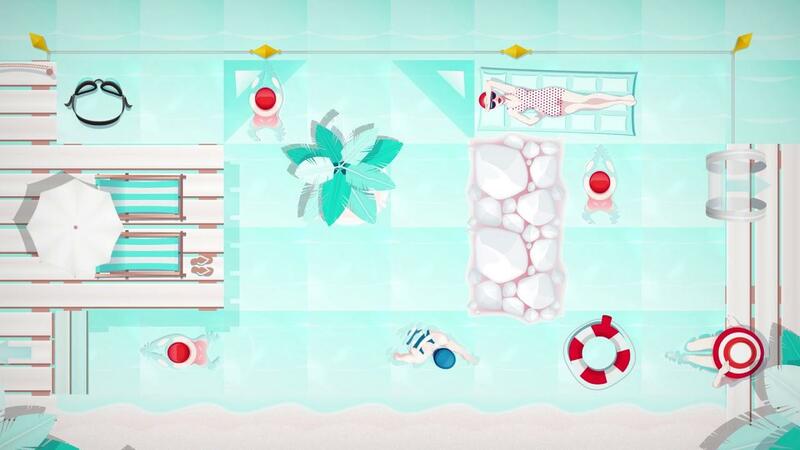 Swim Out, released today, nonetheless combines stylized visuals and audio into a relaxing package. As you might have guessed from the title, Swim Out [Official Site] is all about swimming. You take control of a lone swimmer trying to get to the ladder at the edge of various pools while trying to dodge other swimmers and hazards. Controls are simple, with only the swimmer’s movement in four directions mattering most of the time. Occasionally you might need to use an item but this is a game that shys from the complex and rewards intuition. The puzzle elements of the game are also straightforward and easy to comprehend. The swimmer that players control generally moves one square at a time in the direction you specify. Whenever you move, every other swimmer and (in later stages) various props also move. 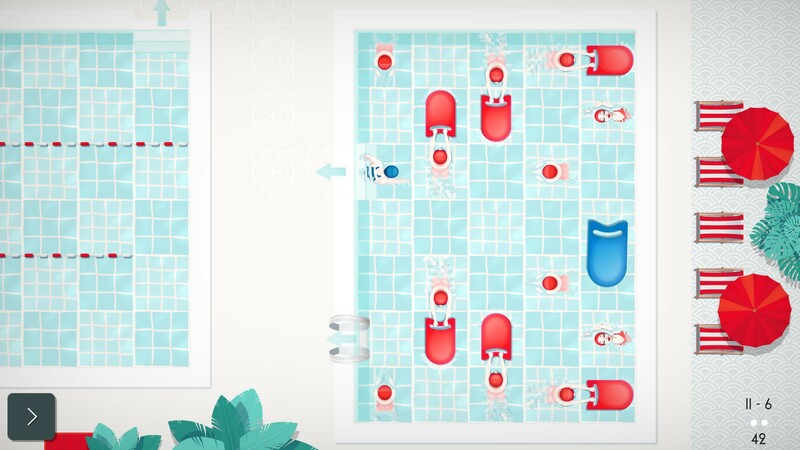 They each have their own properties and move patterns, such as swimmers jumping into the pool doing cannonballs and stunning anyone adjacent so the game becomes a matter of figuring out of where to move and when in order to get to the end. The learning curve is gentle and the game generally eases you into new situations and types of hazards as you go along. Items start to appear before too long, letting you stun other swimmers or move faster for a limited time. There’s no explanation for what each thing does the first time you encounter it, but the game does a good job at being self-evident and teaching you the right application necessary to solve the puzzle and get to the end of the level. As the levels get more difficult and complex the game mostly manages to avoid becoming frustrating and even with some trial and error it’s easy enough to muddle through. The aesthetics of the game are laid back, minimalist and contribute to the casual atmosphere of the game. There’s little in the way of music during gameplay and most of the sounds you’ll hear are of water, items and the location you’re in. It’s fitting and I think that a proper soundtrack would have taken away from the almost zen-like charm that the game has when you get into the groove. Even some of the later hazards and puzzle elements like fish and crabs are a cute if not entirely logical addition to the stages. It just feels right to be swimming around, avoiding over-eager divers, relaxed swimmers doing the backstroke, beginners with pool noodles, and people just relaxing and dipping their toes at the edge of the pool. There’s over 100 levels in the game and most can be finished in a few minutes. There’s varied design and puzzles but there’s nothing too challenging for veteran puzzle gamers. There’s occasionally a few extra stars strewn about the pool to be collected but you don’t need to bother with them if you don’t want to and it’s perfectly fine to simply make it to the exit. Overall, it’s easy to recommend Swim Out if you’re looking for a simple puzzle game you can pick up and play, and put aside, without committing to it. I was charmed by the laid back vibe of the game and appreciate the simplicity in design and control. It’s not the kind of game I’d suggest to someone serious about brain-wracking puzzles and solving things creatively but that’s not the intended audience for this. You can grab Swim Out on Steam. Looks like a funny little puzzle game. The gameplay reminds me of DROD. I'll give it a try, I guess. It's a nice sweet game, i tested it for them on SteamOS before release and it worked near perfectly. Very similar to the Hitman puzzle game, so if you liked that game, you'll like this one too. On top of that, it's dirt cheap.